Did you know your workplace may be making you sick? 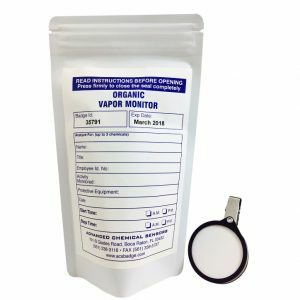 ACS Monitoring Badges give you a cost-effective air sampling method that measures exposure to many regulated toxic vapors. This is a huge improvement over the mechanical sampling pump that was used for years to measure chemicals in the air. The pump had to be calibrated before and after the sampling period, which was a lot of work and very costly. Fortunately, ACS passive monitoring was developed to end air sample collection by a mechanical pump. A solid adsorbent separated by a porous membrane replaced the pump, although it acts like a pump with no moving parts. The method is more accurate without the complexity. There is no training required to use a badge. Our price is all inclusive, which means there is no additional charge for analysis and report after you send in your samples. A monitoring badge is a cost-saving method because there is no maintenance cost, no extensive training required, and the all-inclusive pricing model is simple. A lot of experience has gone into the development of this streamlined process. In fact, there are many high-profile users, such as the Sierra Club and how they use our badges for the monitoring of indoor air quality in FEMA trailers. Our users turn to our product because it’s reliable and has a positive impact on their bottom line. This impact is not just due to the affordability of the product, but the liability that it prevents. ACS Monitoring Badges have been featured on HDNet, CNN, and other media outlets. Who Uses ACS Monitoring Badges? 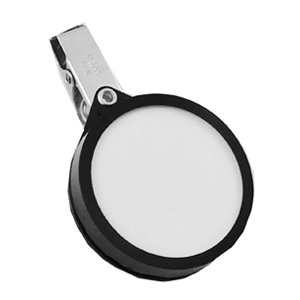 For occupational exposure, ACS monitoring badges meet OSHA requirements and ISO 9001:2015 and ISO/IEC 17025:2005 standards for exposure times ranging from 15 minutes to more than 8 hours. This analysis is conducted in an American Industrial Hygiene Association Laboratory Accreditation Programs, LLC (AIHA-LAP, LLC) accredited laboratory using OSHA or NIOSH validated methods. Plus, experience is on your side. ACS has been making passive monitors for testing air quality around the world for over 40 years. Furthermore, the Environmental Laboratory Approval Program (ELAP) by the New York State Department of Health certified ACS Lab for the accuracy and reliability of analyses. Lastly, the American Dental Association (ADA) has evaluated the accuracy of our nitrous oxide monitoring badges. The data shows that our nitrous oxide monitoring badge (N-10) is highly accurate. Monitoring badges from two other companies were found to be unacceptable. It’s important to establish an employee monitoring protocol. For their safety, every employee who is regularly exposed to chemicals on the job should be tested. Employees should wear ACS badges while working with chemicals from anywhere between 15 minutes and 8 hours, especially when the chemical concentration is at its highest. When the initial test results are low consecutively, testing should be conducted annually or every 3 months for certain types of chemicals. This will help you maintain personal and environmental monitoring records that follow OSHA regulations. This also keeps your workers safe.